Management tools are often argued to ameliorate public service performance. 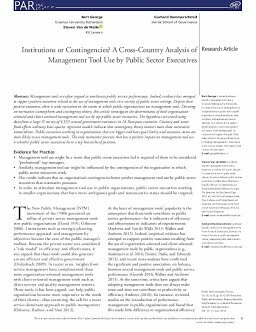 Indeed, evidence has emerged to support positive outcomes related to the use of management tools in a variety of public sector settings. Despite these positive outcomes, there is wide variation in the extent to which public organizations use management tools. Drawing on normative isomorphism and contingency theory, this article investigates the determinants of both organization‐oriented and client‐oriented management tool use by top public sector executives. The hypotheses are tested using data from a large‐N survey of 4,533 central government executives in 18 European countries. Country and sector fixed‐effects ordinary least squares regression models indicate that contingency theory matters more than normative isomorphism. Public executives working in organizations that are bigger and have goal clarity and executive status are more likely to use management tools. The only normative pressure that has a positive impact on management tool use is whether public sector executives have a top hierarchical position.